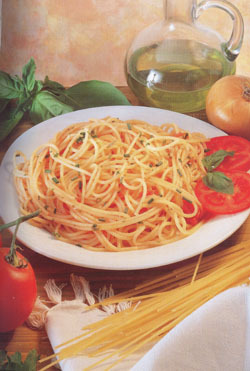 This probably the most classical of traditonal suaces with a tomato base: “pommarola”, considered the sauce par excellence for accompanying pasta.Wash the tomatoes, plunge them into boiling water, skin them, remove the seeds and stalks and then pass them through a food mill. If there is too much water, leave the tomatoes on a sloping surface for about 15 minutes to allow the excess liquid to drain off, then cook over a moderate heat with a little oil. Cook until the mixture thickens (about 30 minutes), seasoning with a pinch of salt and a teaspoon of sugar (this helps to reduce the acid taste of the tomatoes). Just before turning off the heat add the chilli pepper and crushed basil. Boil the spaghetti and drain when al dente, then serve in individual portions, each with a generous amount of sauce and a drizzle of olive oil.